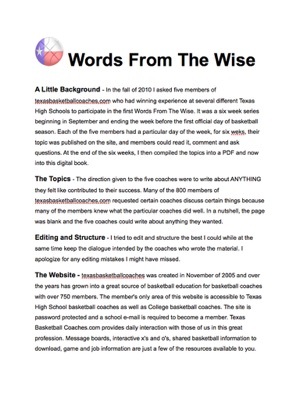 In the fall of 2010, five members of texasbasketballcoaches.com who had winning experience at several different Texas High Schools participated in the first Words From The Wise. It was a six week series beginning in September and ending the week before the first official day of basketball season. Each of the five members had a particular day of the week, for six weks, their topic was published on the site, and members could read it, comment and ask questions. At the end of the six weeks, I then compiled the topics into a PDF and now into this digital book. As a high school coach, nothing can be a substitute for the experience of having been there. This collection of basketball do's and don'ts combined with personal journeys and anecdotes from basketball and life will be a valuable resource for any high school or middle school coach. 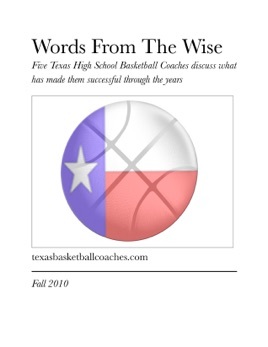 This is a collection of stories, thoughts, and plans that EVERY coach at any stage of their career needs to read. It is not written in a way to impress, but rather to invest. These successful coaches took the time to share in a candid way what they feel and what they have learned through experience. That is a priceless gift. Thanks to the authors and thanks to Mr. Jones for his work in making sure this great collection is available to all. Thanks for investing back into the profession that you all have already given so much.